color workflow H Smart color management. Encore Hollywood exploits฀the฀cloud OLLYWOOD — Encore Hollywood is a full-service post studio that focuses on episodic television series, including Body of Proof, Castle, CSI: Las Vegas, CSI: NY, Enlightened, Glee, Hawaii 5-O, Justified, Magic City, Nashville, NCIS, The Newsroom, Rais- ing Hope and Last Resort. They provide near- set dailies, color grading, editorial finishing and visual effects. 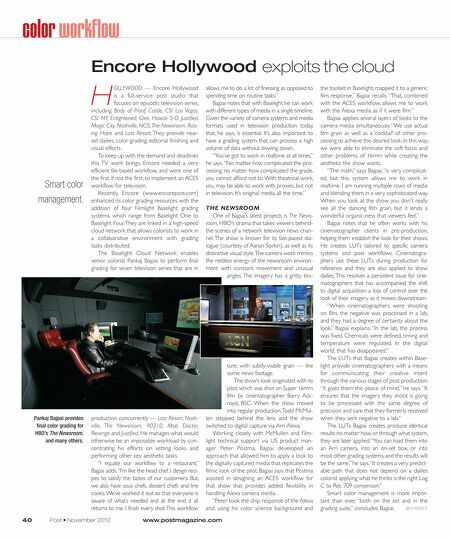 To keep up with the demand and deadlines this TV work brings, Encore needed a very efficient file-based workflow, and were one of the first, if not the first, to implement an ACES workflow for television. Recently, Encore (www.encorepost.com) enhanced its color grading resources with the addition of four Filmlight Baselight grading systems, which range from Baselight One to Baselight Four. They are linked in a high-speed cloud network that allows colorists to work in a collaborative environment with grading tasks distributed. The Baselight Cloud Network enables senior colorist Pankaj Bajpai to perform final grading for seven television series that are in allows me to do a lot of finessing as opposed to spending time on routine tasks." Bajpai notes that with Baselight he can work with different types of media in a single timeline. Given the variety of camera systems and media formats used in television production today, that, he says, is essential. It's also important to have a grading system that can process a high volume of data without slowing down. "You've got to work in realtime at all times," he says. "No matter how complicated the pro- cessing, no matter how complicated the grade, you cannot afford not to. With theatrical work, you may be able to work with proxies, but not in television. It's original media all the time. " THE NEWSROOM One of Bajpai's latest projects is The News- room, HBO's drama that takes viewers behind- the-scenes of a network television news chan- nel. The show is known for its fast-paced dia- logue (courtesy of Aaron Sorkin), as well as its distinctive visual style. The camera work mimics the restless energy of the newsroom environ- ment with constant movement and unusual angles. The imagery has a gritty tex- the toolset in Baselight, mapped it to a generic film response," Bajpai recalls. "That, combined with the ACES workflow, allows me to work with the Alexa media as if it were film." Bajpai applies several layers of looks to the camera media simultaneously. "We use actual film grain as well as a 'cocktail' of other pro- cessing to achieve the desired look. In this way, we were able to eliminate the soft focus and other problems of 16mm while creating the aesthetic the show wants. "The math," says Bajpai, "is very complicat- ed, but this system allows me to work in realtime. I am running multiple rows of media and blending them in a very sophisticated way. When you look at the show, you don't really see all the dancing film grain, but it lends a wonderful organic-ness that viewers feel." Bajpai notes that he often works with his cinematographer clients in pre-production, helping them establish the look for their shows. He creates LUTs tailored to specific camera systems and post workflows. Cinematogra- phers use these LUTs during production for reference and they are also applied to show dailies. This resolves a persistent issue for cine- matographers that has accompanied the shift to digital acquisition: a loss of control over the look of their imagery as it moves downstream. "When cinematographers were shooting on film, the negative was processed in a lab, and they had a degree of certainty about the look," Bajpai explains. "In the lab, the process was fixed. Chemicals were defined, timing and temperature were regulated. In the digital world, that has disappeared." The LUTs that Bajpai creates within Base- ture, with subtly-visible grain — like some news footage. The show's look originated with its Pankaj Bajpai provides final color grading for HBO's The Newsroom, and many others. production concurrently — Last Resort, Nash- ville, The Newsroom, 90210, Mob Doctor, Revenge and Justified. He manages what would otherwise be an impossible workload by con- centrating his efforts on setting looks and performing other key aesthetic tasks. "I equate our workflow to a restaurant," Bajpai adds. "I'm like the head chef. I design reci- pes to satisfy the tastes of our customers. But, we also have sous chefs, dessert chefs and line cooks. We've worked it out so that everyone is aware of what's needed and at the end it all returns to me. I finish every shot. This workflow 40 Post฀•฀November฀2012฀ pilot, which was shot on Super 16mm film by cinematographer Barry Ack- royd, BSC. When the show moved into regular production, Todd McMul- len stepped behind the lens and the show switched to digital capture via Arri Alexa. Working closely with McMullen and Film- light technical support via US product man- ager Peter Postma, Bajpai developed an approach that allowed him to apply a look to the digitally captured media that replicates the filmic look of the pilot. Bajpai says that Postma assisted in designing an ACES workflow for that show that provides added flexibility in handling Alexa camera media. 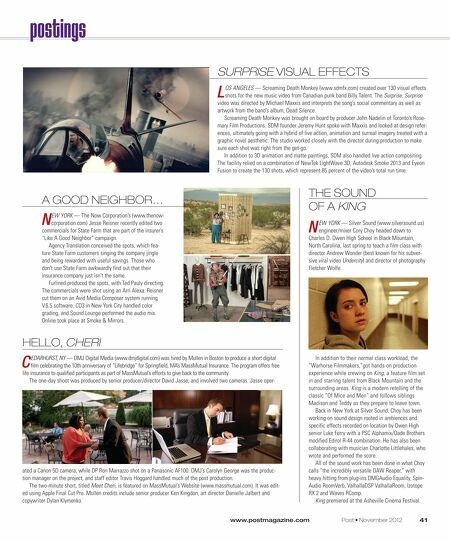 "Peter took the chip response of the Alexa and, using his color science background and www.postmagazine.com light provide cinematographers with a means for communicating their creative intent through the various stages of post production. "It gives them the peace of mind," he says. "It ensures that the imagery they shoot is going to be processed with the same degree of precision and care that they formerly received when they sent negative to a lab." The LUTs Bajpai creates produce identical results no matter how, or through what system, they are later applied. "You can load them into an Arri camera, into an on-set box, or into most other grading systems, and the results will be the same, " he says. "It creates a very predict- able path that does not depend on a dailies colorist applying what he thinks is the right Log C to Rec 709 conversion." Smart color management is more impor- tant than ever, "both on the set and in the grading suite," concludes Bajpai.